All major credit cards: Visa, MasterCard, American Express & Discover. Shipping: We ship through the United States Postal System- USPS. USPS ships to physical addresses and P.O.Boxes. Due to our shipping calculator, and the combination of products ordered, some orders that are over charged shipping rates, will be refunded once your order is fully processed. International shipping: Approximate international shipping is displayed at time of order to be to be confirmed once order is placed. Be sure to include email and contact information for confirmation. Returns: Products are returnable in the event of shipping error, defect, or damage only. Orders subject to shipping error, defect or damage may be returned. The product must be unopened and unused in the original packaging and shipping box. MONSOON NECTAR will not pay for any shipping charges associated with either the initial shipment or with the return shipment. Back Orders: Out-of-stock items occasionally occur. Advise us when reviewing your order confirmation how you would like to have an out-of-stock item handled. Order Correction: If you wish to make an order correction we prefer that you call us to ensure the change is made immediately. If you send an email, be sure to put "order correction" in the subject and also reference the order number. Price Quote: Effective for 30 days from quotation date. This quotation is void when replaced with a new quotation to accommodate any changes, additions, or deletions. MONSOON NECTAR accepts cancellations if orders have not been shipped. Orders are shipped direct from MONSOON NECTAR. Tracking is provided and will be sent to the email address provided by customer when the order was placed. Please allow approximately 5 days for delivery from the date we successfully process your order, back ordered items 5-10 business days. National holidays taken into consideration, there may be certain times of the year when delivery is further delayed. Large Orders: First time, new account wholesale orders may take 3-8 weeks depending on the size of your order. Please allow enough lead time for your first time order. Small Orders and existing account orders: Allow 3-5 business days. Qualifying wholesale orders are shipped USPS or UPS Ground Residential, to be specified. Customer is responsible for published shipping cost based on the service they choose. A 20% return charge plus accrued shipping expenses will be charged to customers who reject or are nor available to accept delivery. International orders will arrange shipping details at the time the order is placed. Monsoon Nectar’s (MN) policies provide insurance on all of our shipments which is part of the shipping and handling fee. Lost packages are excluded from insurance coverage on un trackable services selected by customers. Upon provided evidence of loss or damage, MN will act immediately to replace the loss or damage without waiting for a determination by the shipper. MN coordinates the filing of any damage claims and immediately replaces your shipment expeditiously! Do not sign for a shipment until you have checked for external damage. If a shipment is damaged, save all packaging & containers for damage inspection by our shipping company. Contact us immediately. In order to ensure your interests are served and needs met, we need your timely cooperation. Information Policies: Monsoon Nectar, LLC does not offer medical advice, nor is anything contained on its pages intended to constitute professional advice for medical diagnosis or treatment. If you contact Monsoon Nectar, LLC, the information provided is not intended as medical or professional advice, nor can it be relied upon for medical, legal or financial decisions. In no event shall Monsoon Nectar, LLC. be liable for any damages including, but not limited to, direct, indirect, incidental, special, or consequential damages (including without limitation, damages for loss of business income or profit, business interruption, loss of data, manufacturing damages, or any other loss whatsoever) arising out of, or in connection with Monsoon Nectar, LLC . 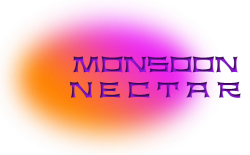 Intellectual Property: You may view Monsoon Nectar, LLC’s web site using a Web browsing application. Permission to reprint, digitally reproduce any page, duplicate text from a page, or to duplicate graphic material is expressly prohibited without permission. Ordering customers have the permission to download pricing information for their private and internal use. Copyright Monsoon Nectar, LLC 2013.